PerryGolf clients enjoy a post-round pint overlooking the Old Course, St Andrews. In addition to many of the world’s most renowned links golf courses and finest accommodations, St Andrews is also blessed with many great ‘19th holes’ to visit for a pint or dram after golf. Unfortunately, choosing this perfect pub to enjoy with your friends while you reminisce over your round can be a complete shot in the dark if it’s your first time in the Home of Golf. That’s why we’ve created for you a list of our favourite pubs in the Auld Grey Toon. 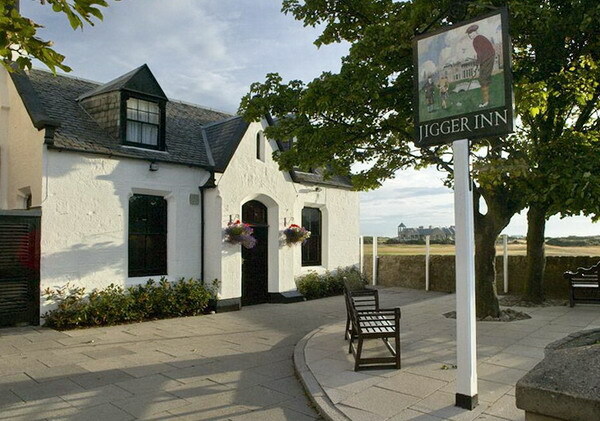 Personally my favourite is the Jigger Inn (pictured above & below), which is owned by the Old Course Hotel. It sits just to the right of the Road Hole (17th) and on a nice sunny day there is no better place to enjoy decent pub grub and good Scottish ales, while you watch fellow golfers live and die on one of the toughest and most famous holes in golf. Heading into StAndrews centre you’ll be spoilt for choice. Options include Greyfriars on North Street, which is probably the best place to go to watch sports as it has numerous large TV’s. One Golf Place is a good option for casual food and is located only a stone’s throw from the first tee of the Old Course. Found just around the corner from One Golf Place is the famous Dunvegan which is a favourite of the St Andrews caddies, so there are always plenty of stories to be told in there. If you’re looking for something a bit younger and trendier, The Rule Pub Diner plays up to date music and is a favourite with the university students. The Keys Pub, located between North and South Street, is a locals’ favourite where local characters are never in short supply. For more information on pubs in St Andrews, I recommend the article below.